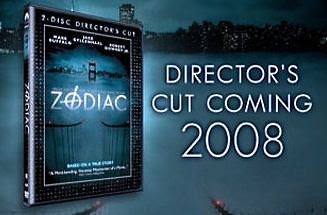 This press ad for Zodiac's imminent DVD release has announced a 2008 double dip for the film, next time offering a Director's Cut. Really a Director's Cut? Fincher was forced to fiddle with this first version? I have no idea what the differences will be but - sheesh - it can't be any longer, can it? The only thing I remember Fincher having to trim was during the part where the screen is black and the text reads "Four years later". His original intent was to have the screen remain black for a longer period of time, in which he would play a montage of popular songs from those four years, which would show the passage of time. Though, I'm sure there's a lot more stuff Fincher had to cut out. There always is. I think Fincher is a great filmmaker, but I hate that he always pulls this crap. For the longest time, "Seven" and "Fight Club" (and, to a lesser extent, "Panic Room") had bare-bones DVD releases, and then Fincher comes out of nowhere with fully-loaded packages. Why not just release the fully-loaded versions at the same time? it's a really interesting blog, nice pics and articles, so great, congratulations !!! As far as I understand, they wouldn't allow him to do the director's cut, all the special features (again produced by the genius David Prior), etc. without this version coming out first. Here in the U.S. the first edition of "Fight Club" was the one with all the special features. And the "Seven" and "Panic Room" discs were worth the wait.